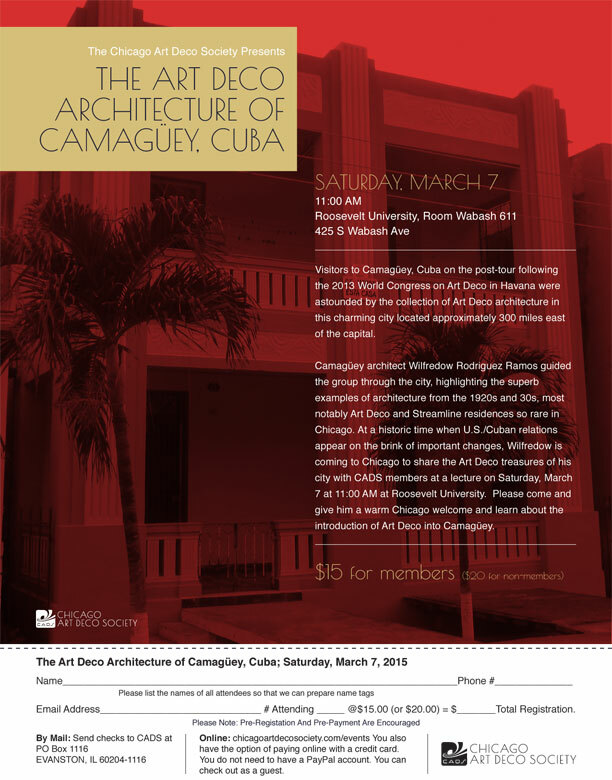 The Chicago Art Deco Society welcomes Cuban architect Wilfredow Rodriguez Ramos, president of the Camagüey Art Deco Society and the Camagüey chapter of DOCOMOMO, who will be presenting two lectures while visiting Chicago. Flyers and information are below. The March 4th lecture at Cliff Dwellers will provide a general overview of the history, culture, and architecture of Camagüey, while the March 7th lecture at Roosevelt University will focus on Camagüey’s Art Deco architecture. Visitors to Camagüey, Cuba on the post-tour following the 2013 World Congress on Art Deco in Havana were astounded by the collection of Art Deco architecture in this charming city located approximately 300 miles east of the capital. Camagüey architect Wilfredow Rodriguez Ramos guided the group through the city, highlighting the superb examples of architecture from the 1920s and 30s, most notably Art Deco and Streamline residences so rare in Chicago. At a historic time when U.S./Cuban relations appear on the brink of important changes, Wilfredow is coming to Chicago to share the Art Deco treasures of his city with CADS members at a lecture on Saturday, March 7 at 11:00 AM at Roosevelt University. Please come and give him a warm Chicago welcome and learn about the introduction of Art Deco into Camagüey.